Is It All a Joke? Who's Not Honoring Stephen Colbert Now? Cate Plys (J84) of Chicago is a playwright and former political columnist for the Chicago Reader and the Chicago Tribune. Her recent work has appeared in Slate and Time Out Chicago. Comments. Questions. E-mail the editors at letters@northwestern.edu. Comedy Central star goes beyond truthiness about his Northwestern days and why he gave up drama for improv. Stephen Colbert donned a skintight speedskating suit last year at age 45 for the cover of Sports Illustrated, modeling an outfit only slightly more forgiving than a thong. In 2006 he mercilessly dissected President George W. Bush’s Iraq war policies onstage at the White House Correspondents’ Association dinner as Bush listened from one seat away. “He believes the same thing Wednesday that he believed on Monday, no matter what happened Tuesday. Events can change; this man’s beliefs never will,” Colbert intoned with a perfectly straight face. How do you embarrass this guy? National Enquirer executive editor Barry Levine managed it during an August appearance on The Colbert Report (Comedy Central, weeknights at 10:30 p.m. CST). “What do I have to do to be salacious enough to make it onto [your] cover?” Colbert demanded. Colbert put his hand over his mouth, chagrined. The country’s most arrogant, obnoxious faux conservative TV pundit isn’t just faking his extreme politics. He’s faking the arrogant and obnoxious part, too. For those who haven’t caught his act yet, let’s recap: Stephen Colbert (C86) plays a character named Stephen Colbert on the award-winning Colbert Report, which draws an average nightly audience of 1.2 million viewers. Stephen Colbert the character began as a correspondent on Comedy Central’s The Daily Show in 1997 and evolved into a satiric embodiment of right-wing TV hosts and self-important journalists — principally based on Fox News’ Bill O’Reilly, with a dash of Stone Phillips and Geraldo Rivera. The Report launched in 2005, with Colbert as executive producer. Meanwhile, former Northwestern colleagues rave about the real Colbert: Remarkably lovely. Completely deserving. Nice, nice, nice. And the amazing thing is, they mean it. The real Colbert is a devoted suburban New Jersey husband and father of three and former Sunday school teacherwho promotes charities such as DonorsChoose.org and the Yellow Ribbon Fund. At his Manhattan office, told about the accolades from his Northwestern classmates and professors, real Colbert responds first with classic TV Colbert bravado. “Fooled ’em. Fooled ’em again!” he barks. Colbert is taking a midday break in his punishing production schedule, creating and performing new shows four nights a week for about nine months each year. The Colbert Report operates from a brick townhouse attached to a blocky, windowless studio building. The townhouse offices are homey, with exposed red brick walls and staffers’ dogs padding around the place. Colbert’s second-floor windows overlook West 54th Street, and the room feels like a comfy den. On TV Colbert dresses in staunchly conservative dark suits and appropriately striped ties. Here it’s khakis and polo shirts. Colbert gets away with his almost incomprehensibly offensive statements because he does it in character. But it’s also because this Stephen Colbert — the one who pushes his face into his desk when he hears too many compliments — makes TV’s Stephen Colbert capable of insulting everyone in his audience to thunderous applause. By “that guy,” of course, he means Stephen Colbert. Before each taping, Colbert enters his glowing, narcissistic set — his name emblazoned everywhere, his desk itself forming a giant “C” around him — and engages the audience. “Any questions to humanize me in your eyes before I start saying these terrible things?” he calls cheerfully before a September show. Colbert doesn’t just work with a script. He has to improvise his character’s response as the show develops, particularly during guest interviews, figuring out how to make his point by saying the exact opposite. In contrast, Colbert’s equally acclaimed colleague, Daily Show host Jon Stewart, essentially plays himself on TV. So Colbert plays Ginger Rogers to Stewart’s Fred Astaire — doing everything backward and in high heels. “I think it’s impossible what he’s doing,” says Posner. “You wonder, ‘How does Stephen do it?’ ” says former roommate Eric Goodman (C87), now a Disney “Imagineer” and show producer of Epcot Center’s The Sum of All Thrills simulated ride. “He has to twist it in his head so he says something completely absurd, which he would never say in real life, but seems completely plausible. The real Colbert explored his ancestry this year for Harvard professor Henry Louis Gates’ PBS series Faces of America and found out his DNA is entirely European — Irish-German. “I am the inescapable black hole of white people,” he quipped. Where does the TV Colbert come from? Northwestern friends see a direct line between Colbert’s work at Northwestern and his late-night character. The cigar-chomping, high-status idiot also traces back to a character Colbert and friends started playing with after a group of agents visited campus looking for acting prospects, say former roommates. Mary Siewert Scruggs (C86), now head of writing and education programs at the Second City Training Center, used the agent character to write the part of the miller for Colbert in Rumpelstiltskin v. the Queen, the first of several plays in the Fairy Trials, an educational program for the Circuit Court of Cook County. Scruggs, Colbert and a group of fellow then-recent Northwestern grads — all from a class taught by associate professor Ann Woodworth (C75, GC79) — formed the Journeymen Theater Ensemble and made Rumpelstiltskin a main project, taking the play to schools around Cook County. “Whenever that character was enacted, there was always an invisible cigar — you had to chomp down on the invisible cigar,” says former Colbert roommate and Journeymen member Kellie Overbey (C86), now a Broadway actor whose credits include Sam Shepard’s Buried Child. Colbert would go on to perfect his high-status idiot at Second City and later with friends and fellow Second City performers Amy Sedaris and Paul Dinello through two early series on Comedy Central — the sketch comedy program Exit 57 and the cult classic Strangers with Candy. Colbert transferred to Northwestern as a junior from Virginia’s all-male Hampden-Sydney College, completing Northwestern’s three-year acting program in two years. During this period of his life he has described himself as a self-important “poet/jerk,” planning on a serious acting career and walking around in black turtlenecks. Yet he’d already discovered Chicago improv. Colbert says friend Chris Pfaff (C87) first took him to the now-defunct Crosscurrents club in Chicago to see teams at the fledgling ImprovOlympic, now iO, perform “the Harold,” an improv game invented by iO founders Del Close and Charna Halpern. “I said, ‘I have to do this. I have to improvise,’” Colbert recalls. “I just loved going onstage with nothing planned and, through agreement, trying to create a one-act play, which is what they did.” Colbert began performing weekly with a Northwestern improv team called No Fun Mud Piranhas, which included David Schwimmer (C88), later of Friends fame. “I still have my No Fun Mud Piranhas T-shirt,” Colbert notes proudly. Back on campus, Colbert played Golaud, one of the three leads in Pélléas and Mélisande by 19th-century symbolist playwright Maurice Maeterlinck. Colbert’s character (center in photo below) eventually finds his wife and brother together and kills Pélléas and wounds Mélisande, who later dies after childbirth.“The play was terrible, awful — shouldn’t have been seen onstage,” says Ayun Halliday (C87), a New York City writer who was Colbert’s girlfriend at the time and part of the chorus. When Golaud discovers his wife’s infidelity, says Halliday, Colbert roared onstage with a battle-ax over his head. “I was draped over the doorway, totally bored, with my foot hanging down, and he almost lopped off my bare foot with a prop,” she says with a laugh. 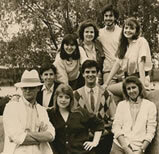 Most friends weren’t shocked when Colbert ended up, only two years out of college, with the Second City touring company. “There was always this dichotomy. He loved diving in deep, but there was that part [of him] that stands aside and sees the ridiculousness of it,” says Libera. 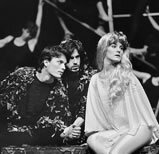 Stephen Colbert, center, in a campus production of Pélléas and Mélisande. Colbert grew up the youngest of 11 just outside Charleston, S.C. His other siblings had left home by 1974, when the plane crash killed his father and two next oldest brothers. Speaking of that time period, he has described himself as being somewhat alienated from schoolyard issues, which no longer seemed important. He also began a lifelong fascination with science fiction and fantasy, diving into Dungeons & Dragons and becoming a Lord of the Rings aficionado. After Northwestern, Colbert’s roommate Libera started work at Second City’s box office and soon brought in Colbert, who “was making futon frames out of 2-by-4s” in the basement of the house they shared with a revolving cast of roommates at Foster and Ridge. 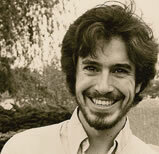 Even after joining the touring company, though, Colbert quit four times to go back to straight theater. Finally there came a moment onstage at Second City that clinched it. “I saw someone fail onstage — terribly, massively fail onstage,” Colbert recalls. “And we backstage laughed so hard at this woman’s failure, and our laughter was so joyful and not derisive. I remember turning to a friend of mine, Dave Razowsky, and we threw our arms out wide and hugged each other in laughter and literally fell to the ground in each other’s arms over the joy of that failure. Later that year the American Dialect Society voted “truthiness” the 2005 Word of the Year, defining it as “the quality of stating concepts or facts one wishes or believes to be true, rather than concepts or facts known to be true.” Merriam-Webster followed with the same honor in 2006. Soon New York Times columnist Frank Rich was using the word often enough to pay royalties. In the aftermath, some accounts portrayed Colbert as uncomfortable with the brouhaha over the dinner. But Colbert insists now the dinner isn’t a sore point. “I’m perfectly comfortable talking about it. I just don’t talk about it. … I may or may not answer your question, but you can ask me anything you want,” he says. “I had a really good time,” he adds with a definite glint in his eye. “What you don’t know,” Colbert goes on, “is that there were 3,000 people in there, and even the things that didn’t go well,” his voice drops to a whisper for emphasis, “a thousand people laughed. … What you don’t know is that the people on the dais in the front row were going like this,” he continues, holding his hands in front of his face and peeking through his fingers. “But it went pretty well,” he laughs. Colbert’s classmates agree. “That was pretty f---ing great,” says Overbey. “That was even more exciting than the fact that he has a Ben & Jerry’s flavor named after him,” says Halliday. What’s next? For now Colbert has signed to stay with the Report through the 2012 presidential election, which means he’ll be tired for a couple of more years.